I was struck by the difference between waiting room space and the promise of a capacious inner office, in the waiting area. The sanctum was partially visible through an open half-window, only revealing hints of what lie behind the door. If I were a child, I would have been terrified. From a lower vantage point, I would only have seen the ceiling, with no clue of what was waiting for me inside. 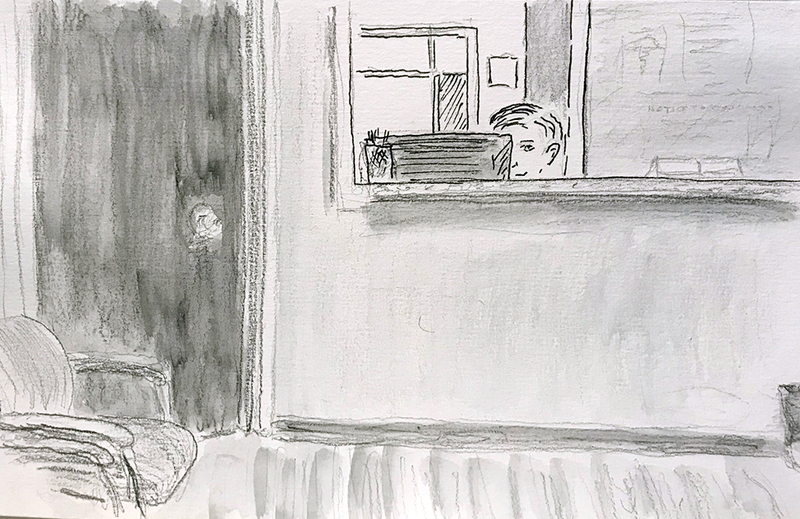 This entry was posted in Personal Stories and tagged 15 minute sketch, art, artistic process, depiction of space, drawing, pen and ink, pencil sketch, space, Waiting Room, watercolor wash. Bookmark the permalink.